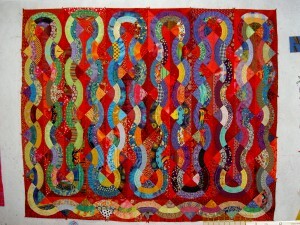 Kristen asked to see a picture of Seeing Red, which was the bullseye quilt from last year. Here it is. It was quilted by Colleen Granger. Beautiful! Love the sensuous curves, soft and subtle, combined with the “in your face” red! Thank you! The layout of this bullseye is one of my favorites.